Shen and Sika meet in the frozen north on the first day of True Winter. 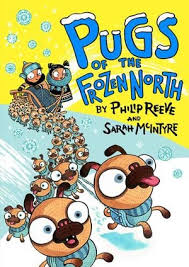 Sika needs dogs to pull her sledge and help her win the race to the Snowfather’s Palace at the top of the world. 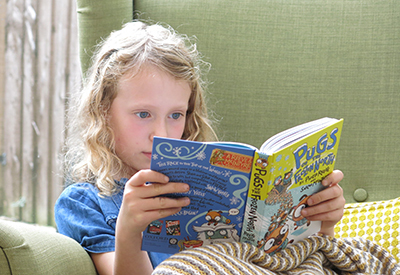 Shen, a cabin boy, abandoned by his crewmates when their ship becomes stuck fast in the ice, has 66 pugs he has rescued. They soon team up, but will the small dogs be strong enough to pull Sika’s sledge? A fantastical snowy adventure story about wishes, kindness, loneliness and loss, beautifully told with humour and some poignant moments through a brilliant combination of words and pictures. What would you make if you came across some ‘anything snow’? How did Sika feel when she first met Shen, and before and after meeting the Snowfather? How did Shen’s feelings about what he wanted change? did you find most interesting? 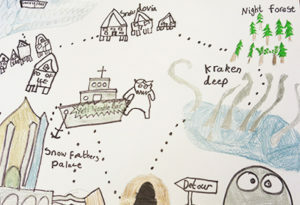 Draw a big map of the storyworld with all the key places included and labelled eg Lucky Star, Po of ice, Kraken Deep, The Lost Hope, The Snowfather’s Palace. 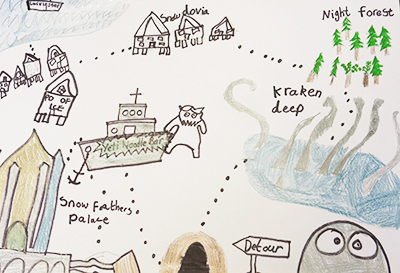 Your child could use their maps to help them tell you the story. Imagining they are either Shen or Sika children could make a mini folded paper diary to write about their visit to the Snowfather’s palace to help them remember the story so they can pass it on. 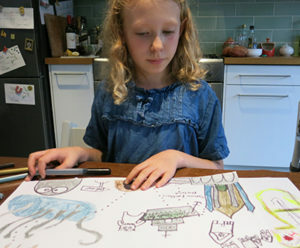 Children could make a booklet about the race to the Top of the World described in the story using a scrapbook or by folding several sheets of A4or A3 paper in half and stapling them. Children could design their own sledge to take part in the competition. What would it look like? Who would it be for? How would it be pulled along? Perhaps children could make a junk model of their design too.